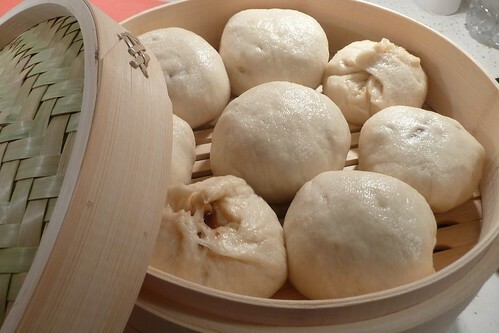 After explaining all the different things we could make with a bamboo steamer, my husband was really intrigued by the idea of steamed buns, or bao. I promised him I’d make him char siu bao or Chinese barbecued pork buns within the week. Now, I’ve steamed a lot of different types of dim sum but I’ve never made bao before. Turns out, it’s not a big deal: the yeast dough is quite simple to make and the filling is deliciously easy. If you have an asian grocery nearby that you can buy precooked char siu, you can skip to the filling part entirely. Just dice it up and add it to the sauce. Also, I’ll warn you: I’m not too familiar with all the variations of char siu. I went with a recipe that I liked but it’s fairly dissimilar from the restaurants in my area, for example. You don’t need to use pork either. I’m planning to fry up some diced chicken and eggplant for my next set of bao. Should be good (and if/when it is, I’ll post about it). Combine all ingredients and marinate roast overnight in a sealed container. I sliced mine into inch-thick slices and roasted for about 45 minutes. Allow to cool and proceed to making the filling. Saute the garlic for a minute or two over medium heat in a bit of oil. Combine everything in a small bowl and set aside. Proof the yeast: Combine yeast, sugar and water in a mixing bowl and let rest for 10 minutes. Knead the dough: Add dry ingredients and knead for 5 – 10 minutes (by hand or by stand mixer) until the dough pulls together and becomes shiny and tight. Remove to an oiled bowl and let rest for 15 minutes, covered. Prepare the buns: Portion the dough into 16 pieces. Flatten each piece into a disc and put about 1/2 tbsp of filling (or so) in the center. Pinch the edges together so it forms a nice, smooth ball. Let them rest for 10 minutes on some parchment paper. Steam: Arrange the buns with space in between on some parchment paper or cabbage leaves in a covered steamer. (Mine is bamboo, as you can see.) 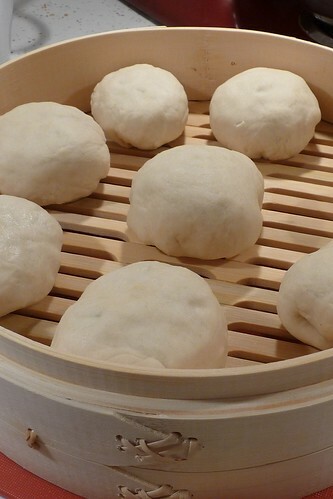 Steam the buns for 8 – 10 minutes. Serve: Serve them hot and fresh or allow them to cool completely then store in a ziptop bag in the fridge (or freezer). If you freeze them, reheat by steaming for 5 – 8 minutes. Buns are good hot or cold. 1. As you can see from the picture, I forgot to put some parchment or cabbage leaves down. (Okay, I didn’t have any cabbage leaves, but I could have used a collard leaf.) These little puppies stick! I’ve a lot of scrubbing to do to get these steamers clean again. So don’t make my mistake, okay? This entry was posted in asian, chinese, dairy-free, gluten-free, pork, recipes, untranslated. Bookmark the permalink.